Ardbeg Uigeadail is a heavily peated, cask strength bottling, produced from a mix of bourbon casks and older sherry casks. It has won Jim Murray’s World Whisky of the Year and Scotch Single Malt awards in 2009 and 2010. I purchased this bottle at the first Whisky Live Sydney event (2009) and Dramcember seemed the perfect occasion to taste and share. Nose: Surprising amounts of phenol and strong medicinal notes. Don’t get too close as you can scorch your nasal passage. Hints of floral bouquet. Taste: Intense. Thick and chewy with vast amounts of wood smoke. There is a sweetness but this is more detectable only with tiny, wee sips. Too much in one go will be met with a hot, burning sensation. Quite tart, like sucking a lemon. Finish: I feel like a fire breathing dragon. Fiery, molten burning. This eventually subsides to a long, tarry finish. Hesitant to go back for more. 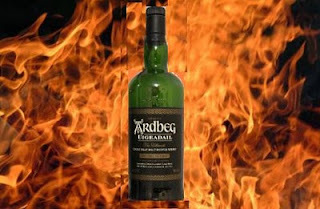 I find too much intensity and burning in this bottling, even for me, a self-confessed Ardbeg tragic. Adding water significantly changed the dram and it become quite palatable and the sweetness much more notable. However, I’m guessing Jim Murray et al (and others), aren’t adding water when performing tastings. If I were to give a dram, it would be 4 out of 7. I much prefer the standard Ardbeg 10yo or Nam Beist.